Benedetta Tavani was born in Frascati in 1984. An anglophile for as long as she can remember, she graduated in Arts (MOdern Languages and Literature and Literary Translation) and became a professional translator in 2010. 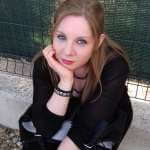 She has worked for several Italian publishers. Meanwhile, she writes poetry, listens to music, teaches English and reads Fantasy every time she has a mind to.